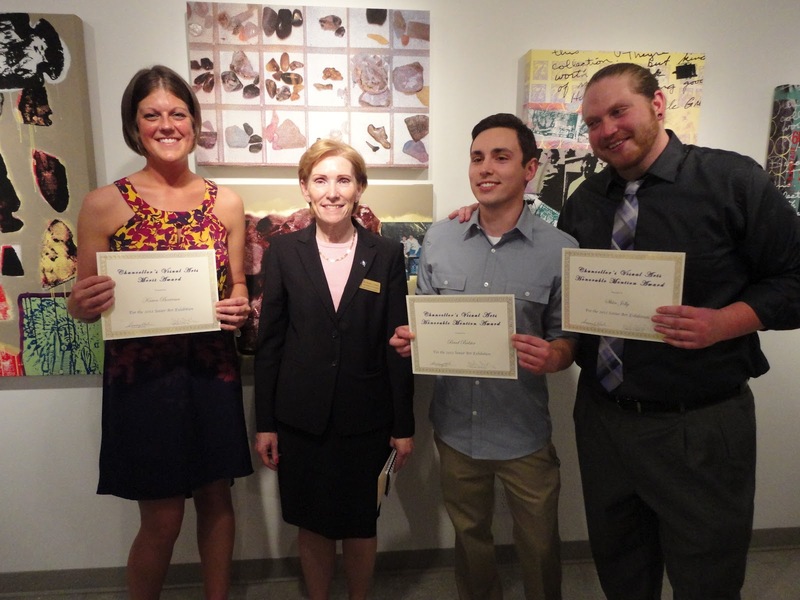 One end-of-year event I have been looking forward to all year is the UIS Senior Art Show …. and it did not disappoint! The galleries were packed Friday evening with students, faculty, parents, grandparents and member of the Springfield community – all enjoying the great show that our visual art students had assembled. I was delighted to present the Chancellor's Award (for best in show) to Karen Boerema for her ceramics installation titled "Coupled." Karen is a ceramics artist who has been studying here at UIS with faculty/artist Shane Harris and is graduating this year with her degree in Visual Arts and plans to make art, I hope, long into the future. She is not only a skilled artisan, but is also a highly intellectual artist whose work is challenging, complex and beautiful. Brad Balster and Skan Jolly received Honorable Mention Awards and I'm looking forward to more great work from them as well.